Linz 2009 European Capital of Culture - Media Echo. The echo that Linz09 provoked in the media was a thoroughly positive one. This applies in particular to the media abroad, which devoted a great deal of attention to Linz as Culture Capital 2009. As of late January 2010, Linz09 had featured in more than 2,600 national and international media (print media, TV, radio and online) that carried more than 25,000 articles on the topic. A recurrent motif was the process of change that had first been initiated by the City of Linz in the mid-1980s. Linz09 added a great deal of momentum to that process. What was also commented on again and again was the credibility with which Linz09 presented the city with its industrial roots, its closeness to nature and its unmistakable, characteristic cultural tradition that welcomes experiments. 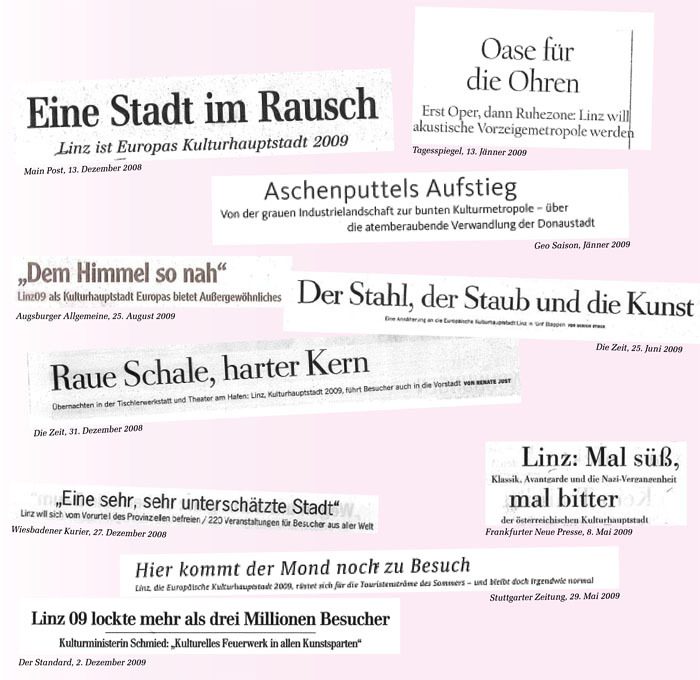 The way in which both the city and the programme of Linz09 dealt with the era of National Socialism without ifs and buts also met with appreciation in the media. Praise for the hospitable nature of the people of Linz was a topic even more in evidence than commendations of the city’s cultural life, its hotels, its restaurants. It was also felt that Linz was refreshingly different in that it did not seem to be afflicted with Austria’s addiction to the past.